#1 All potential customers have a smartphone. They use it to find and communicate with businesses. Will they do business with your franchise or your competitor? The implications of ignoring smartphone users is enormous. 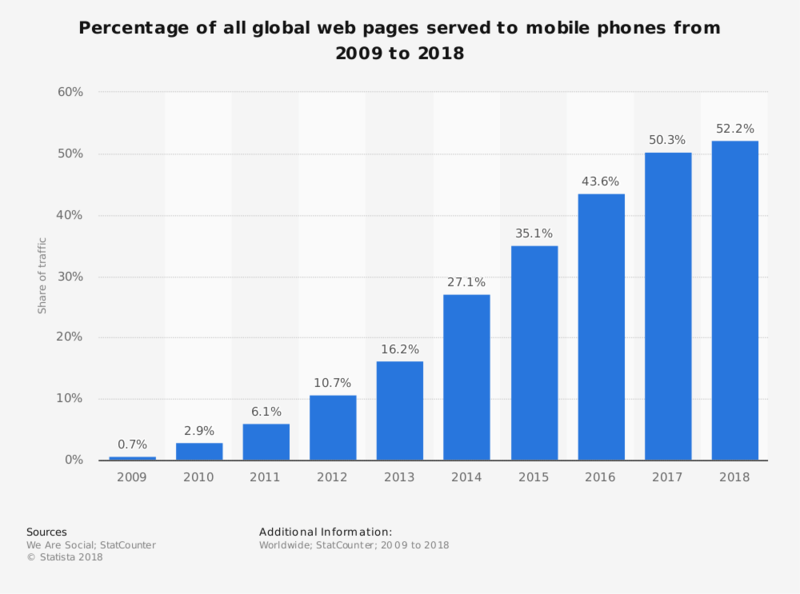 There are now more than 220 Million smartphone users in the U.S. That means more than 50% of website visits are now from smartphones. That’s up from only 2.9% in 2010 (source). Here’s a chart illustrating the point. A fully mobile-enabled website. These websites automatically optimize to fit the visitors device, whether it’s a smartphone, iPad or desktop computer. This makes it easy for potential customers get the information they need about your services and make a purchase decision – a decision to purchase from you. A business phone number that’s always visible and clickable. It’s frustrating to visit a business website on a smartphone and not be able to easily find their phone number. Make sure you don’t frustrate your potential customers. Have your phone number in a always visible footer area and make sure it’s clickable. Clickable means if the user clicks on the number, the phone dialer opens with your number already populated and ready to dial. An SMS text-enabled business phone number. Texting has quickly become the preferred method of communication for many personal and business interactions. Text message open (read) rates are 99%, and 90% of all text messages are read within 3 minutes of being received. Be ready to interact with your potential customers with an text-enabled business phone number. #2 Facebook ad campaigns ARE effective at driving sales and growing business. A social marketing strategy is no longer optional or a “nice to have” for franchises. 79% of online adults in the U.S. now use Facebook. That number was only 11% ten years ago, according to the Pew Research Center (source). Facebook Retargeting Campaigns. These campaigns show ads to people who previously visited your website. If you’ve ever searched for something on Amazon, then seen ads for the same item on Facebook, you’ve been retargeted. These campaigns are a great way to get people to come back to a website and book an appointment or buy services. #3 The majority of people now trust online reviews as much as personal recommendations. 97% of consumers read online reviews for local businesses and 85% of consumers trust online reviews as much as personal recommendations (source). With so much trust given to online reviews, franchisors and franchisees must take a proactive approach to their online reputation. Easy for customers to leave reviews – It should be easy for your customers to provide feedback to your business. Find a solution that uses multiple customer touch points to encourage feedback and reviews. Monitors reviews across the web – Daily monitoring of reviews on Yelp, Google, Facebook and others websites. Provides daily alerts to the business when new reviews are detected. Streams Positive Reviews – Streams positive reviews (4 star and 5 star) to the businesses website so potential customers can read them immediately. We’re bizmktg.com and our mission is to help businesses win online. We’ve helped franchisors, franchisees and local businesses grow. We offer solutions including Mobile Enabled Websites, SMS Text-enabled business phone numbers, Facebook ad campaigns, Online Reviews management, Google Adwords PPC campaign management and more. We’d love to learn more about your business and any marketing challenges you may have.